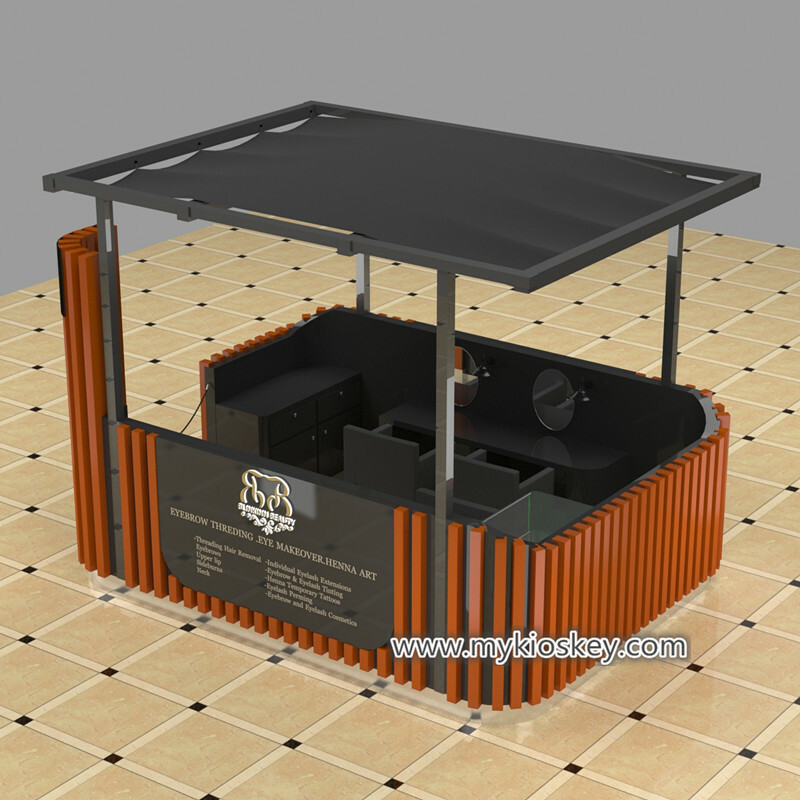 How to customize a suited eyebrow threading kiosk? | Mall Kiosks | Food Kiosks |Custom Retail Kiosks - mykioskey How to customize a suited eyebrow threading kiosk? To be honest, I can understand customers buying kiosk ideas, but I have to say, price standard is not the same, many details and factor will affect it, making one set kiosk, especial customize display kiosk, price is based on the customer requirements and ideas determined, like location size, like design style, logo quantity, materials and so on, however, not all customers all want super cheaper, many customers want to find good design and good quality. So How to choose a style suited eyebrow threading kiosk? Here some suggestion and hope can help you. 1. If you are the first time doing eyebrow threading business , only want to try it and don’t want invest more money , you can rent a small location and choose a simple but fashion design, not need complicated design shape, also no need to use very high-end materials, this can help you save some money; of course ,when you consider price ,also need make a good design and meet your needs. 2. for those customers already had kiosk in mall and want to expand business, in general, they main consider design style and quality, yes, that is very correct, a good design and high quality can help you build own brand and give more business chance, anyone all want to go to a high-end and comfortable store to consumption , so keeping high-end can is sustainable. 3. However for those, only want super cheaper price and not need to consider others, we also can help you, you can directly tell us your budget, of course, the budget has to be combined with reality and market. Dear friends, No matter you want to customize how eyebrow threading kiosk, we all can help you, we have a professional designer team to help you design, we have own workshop and can control cost and provide competitive price, welcome inquiry. PreviousPrevious post:Share some successful cosmetic store fixtures designNextNext post:How I can customize an attractive cell phone kiosk in the mall?